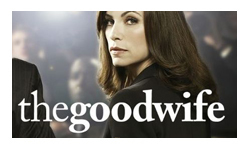 For my broad feelings on The Good Wife you really can just re-read my review of season 3. It does a pretty good job of expressing just how and why I adore this show so much. The cast, the writing, the stories, the humour, the clothes… they’re all still there for season 4. And sometimes they’re even better! For example, just when you think the guest stars can’t get any better, not only do my old favourites return (Martha Plimpton, Mathew Perry, Michael J. Fox) but they’re added to with Nathan Lane, T.R. Knight, Kristin Chenoweth, Carrie Preston, Maura Tierney, Amanda Peet and possibly the most exquisite piece of casting ever – Stockard Channing as Alicia’s mother! Of all the moments in the series that I adore, the scenes with Alicia and her brother (Dallas Roberts, slightly jarring to watch alongside his appearance on The Walking Dead) have always been my favourites, and adding the former First Lady of The West Wing to it made me literally squeal out loud with happiness. While I can say that the positives of the show from the third season still continue, sadly I can say the same about its flaws. Yet again, Kalinda’s storyline just didn’t mesh with the rest of the series, setting off into unsettled and peculiar territory. I’m still convinced there’s a great character there, despite the ridiculous inconsistency of her story-lines. Being mysterious is one thing, but too often the writers send her off into craziness and then have to drag her back into the fold. Hopefully they’ll leave her history and poor relationship choices alone and focus on the far more interesting aspects like her friendships with Alicia and Will and her importance to the firm. Which segues us neatly into the question of how many firms will there be in season 5? Finally Cary has come into his own with his confidence and competence finally being in alignment. The comparisons of him and Alicia with Will and Diane continue to build and season 5 will give them an exciting new context to work in, one that I’m not sure anyone is ready for. Meanwhile Will and Diane came together to fight through their redundancy, but lost a lot in the process and season 5 will be just as hard for them. Like The West Wing, this is a show that I’m never embarrassed to be a fan girl about. Even though I can (and will) explain at length why I love shows like Supernatural, or Firefly I sometimes feel a little apologetic, like the person I’m talking to may look down on me a bit. But The Good Wife is just pure, intelligent, entertaining excellence for grown-ups. I’m practically in mourning now that I have to go months with no new episodes and am sorely tempted to re-watch from the beginning again, just to tide me over.